Secretary of State Rex Tillerson is going to China Sept. 28-30 in advance of Trump's visit in November, State Department Press Secretary Heather Nauert told reporters today. 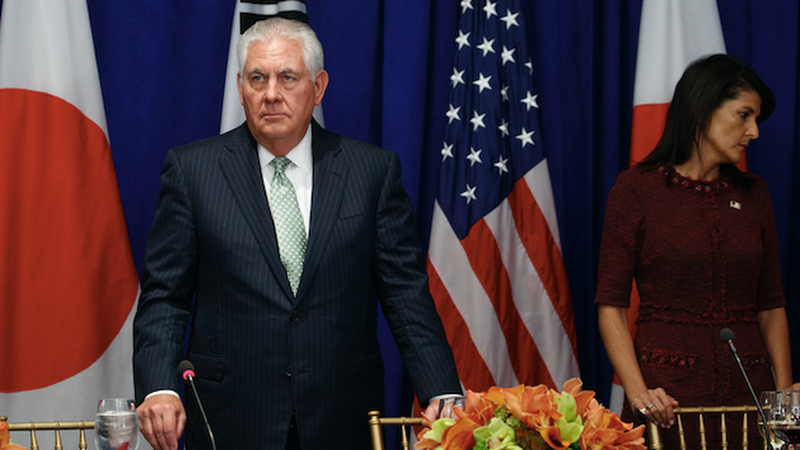 Tillerson will discuss denuclearization of the Korean peninsula as well as trade. On Cuba: Tillerson is meeting with Cuban Foreign Minister Bruno Rodriguez this evening. The Cuban government requested the meeting, Nauert reports. The U.S. government is reviewing whether to close down the U.S. Embassy in Havana after it was uncovered that 21 American diplomats serving in Cuba are experiencing brain damage and hearing loss. Raul Castro denies involvement in the incidents. On the Kurdish referendum for independence: The U.S. "did not support that referendum…we don't see it as taking sides with Baghdad. We support a unified, democratic Iraq." Instead, Nauert said the U.S. wants everyone to focus on defeating ISIS. "This type of division right now could hurt Iraq." On the news that Saudi Arabia will allow women to drive: "It's a great step in the right direction."